CinemaBomb: Снимайте только меня / Put the camera on me. 2003. Снимайте только меня / Put the camera on me. 2003. 1. Before he went on to direct Jawbreaker Sparkler Darren Stein grew up making videos. 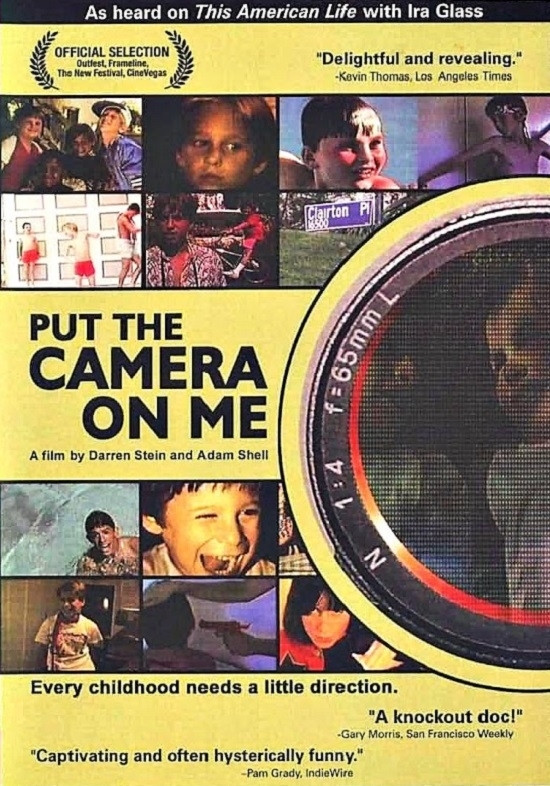 Along with his friend 'Adam Shell' and the other neighborhood kids these young film makers touched on such adult subjects as jealousy, cruelty, and sexuality. 2. The fact that I did not have Internet tonight was more of a blessing than a curse as I get to dig some of the movies that were laying around my external hard drive . Picked an excellent one – it is called “Put the camera on me” and it is a documentary. A documentary – au that must be boring – but no – because that was not an ordinary documentary, but rather fun and very arty made mixture of short movies shoot by Darren Stain. When he was little boy his dad brought home a camera and Darren being very artistic and imaginative soon learned how to use it and was obsessed with the idea of making movies – regular one and crazy one starring himself and his friends . About 20 years later Daren combined these movies and together with his original stars – created the movie I just watched. The best part of this movie was that while watching it I unconsciously started to remember similar situations that have happen to me few years ago– you know playing out with yours friends, having a hell a lot of fun, making cool tricks …etc– so the movie of Daren through not complicated or charged with great ideas or thoughts was quite an experience. It gave me some ideas – like writing down my memories – making a script and getting few friends to play in it – oh I know that that is not probably going to happen – but the idea is cool anyway – imagining how it will be – I guess I will be able to do the first part and if I do you will be able to see few things at my blog. But back to the movie – if you can get a hold on it see it – you won`t regret it. I remember talking with a friend about it. He said that the movie was shoot in such a way that it captured the time of 80`s and watching it is warming and cool experience – like flipping the pages of your own yearbook. Directors: Адам Шелл / Adam Shell, Даррен Стейн / Darren Stein. Cast: Адам Шелл / Adam Shell, Эллен Шелл / Ellen Shell, Даррен Стейн / Darren Stein, Ивэн Стейн / Evan Stein, Илэйн Стейн / Elaine Stein, Рон Стейн / Ron Stein, Майкл Уэйнер / Michael Weiner, Лиза Уэйнер / Lisa Weiner, Роберт Уэйнер / Robert Weiner, Роз Уэйнер / Roz Weiner, Marc Entous, Justin Satinover, Barbara Satinover, Аллен Уильямс / Allen Williams, Хиллари Делл / Hillary Dell. Download Снимайте только меня / Put the camera on me.